Above Photo (Family Archives): CF-AXL moored at a makeshift dock on Touchwood Lake, northeast of LacLaBiche (c1961). The photo was taken on a trip made by Hans Vanderflugt (my instructor) and I while flying out of Cold Lake, AB in the late 50’s and early 60’s. February 20, 2012. After posting this story on February 2, 2012, a young man, Daniel Mahoney, of Vanair Aviation, in Refugio, Texas, happened to pick it up the link off the Web while searching for background on his stepfather Hans. 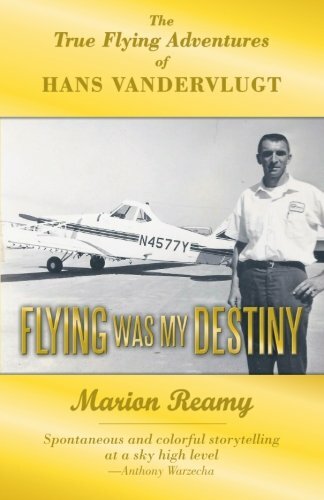 Dan phoned to tell me, Hans Vanderflugt, co-owner of Vanair, had just been killed in a crash near Colorado a few days before I posted the story (more information in the footer). This story is dedicated to the memory of Hans, who is survived by his wife, Ruth Hodge Vandervlugt of Refugio, Texas; one son, John Vandervlugt of Round Rock, Texas; one stepson, Billy Michelson of San Antonio, Texas; and a sister, Erna Fentener Van Vlissingen of Amsterdam, Holland. The following book was recently published about the heroic flying adventures of Hans as he tavelled the world delivering sngle and twin engine aeroplanes. Photo of Hans Vandervlugt (October 2011) on the book cover. At 6:00 am, I was out of bed and heading to the dock on Beaver Lake, about four miles east of LacLaBiche where Axle, the nickname for the Fairchild 82A, CF-AXL, was moored. The aircraft was one of the final two members of the Fairchild Series1 of bush planes built in the 1930’s by Fairchild Aircraft Ltd. Canada, that was still in service. Although not slick and fast, it was a workhorse in which we could haul up to 2000 lbs depending on how much fuel we had to carry. On shorter trips (thirty to forty-five minutes) we only carried sufficient fuel for one or two round trips as each pound of fuel meant a pound less cargo. 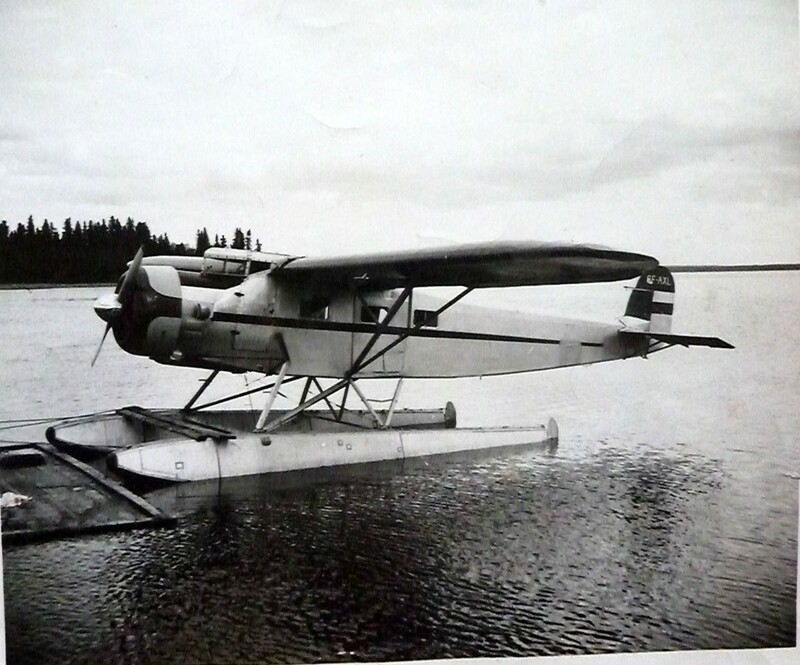 This particular aircraft had travelled to almost every corner of Northern Central and Western Canada, whereever pioneers were working to access the vast array of natural resources hidden among the millions of acres of wilderness rocks, trees, shrubs and thousands of freshwater lakes, rivers and streams that defined the north. Production of the 82A was discontinued when the factory switched to cargo supply and bomber aircraft needed to help fight the Second World War. The Bristol Bolingbroke and the C-19 Packard were the most recognized aircraft being poured out the Fairchild Factory in the 1940s. Unfortunately, production of the 82A series was never resumed as the plans and moulds were inadvertently destroyed during the company’s transition to wartime aircraft. CF-AXL, the aircraft we flew back in the 1950’s and 60’s, currently resides in the Canadian Aviation and Space Museum in Ottawa. It was refurbished and moved to the museum in the 1960’s shortly after we flew it when working for a company owned by the father of a High School friend, Aaron Pinsky (lead photo in the link – top left (Aaron), bottom centre (Harold and Aaron, two cool dudes). We completed our flying training at RCAF Station Cold Lake and regularly flew together during the early years. On this morning I was suffering a bit of a headache after hanging out a little too late with friends, the Gatzke’s, with whom I lived while attending grade five in LacLaBiche some ten years earlier (Link). On other flights, I had also made friends with several others who put me up while on layovers in LacLaBiche. 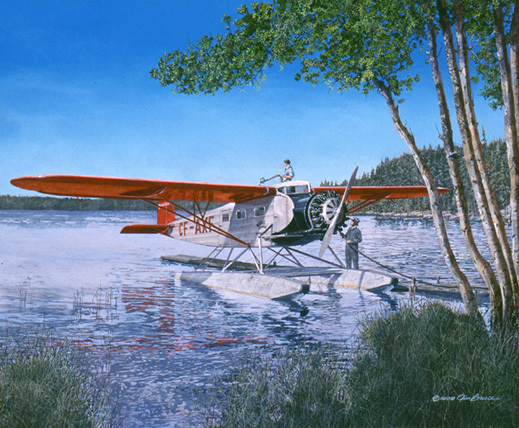 Photo (Painting of AXE by Jim Bruce, Aviation Artists, Web Source): This, the only other 82A in service in Canada, is shown being refuelled while moored to a small dock somewhere in Northern Canada. AXE disappeared in 1964 while on a flight in the Northern Arctic. Link to the story. Note the slide back access to the upper wing from the cockpit. That little door made accessing the fuel tanks much easier (there is also another photo attached to end of story). I can still remember the distinct smell of aviation fuel as we added fuel two or three times a day. We never carried more fuel than necessary as the weight of every extra gallon of fuel had to be subtracted from cargo. By 6:30 Hans Vanderflugt, the Chief Pilot for Alberta Fish Products and I, had pumped the floats and topped up the gas, both accomplished with an ‘arm killer’ toggle pumps. Well, stating it was ‘Hans and I’ was generous as he usually let me do the toggle work while he held the hose. I never complained though as I was more than happy to be getting ‘free’ flying lessons as I built hours towards my Commercial Licence. If I had to do a little pumping, then fly twenty minutes, load 2000 pounds of fish, fly another twenty and unload it, it was a small price to pay for this kind of flying time. Once I had completed the external and internal checks, then started the engine, Hans would cast off, jump into the co-pilots seat. We would taxi into the bay for our first flight of the day. Today, however, was to be different. Photo (From the files of a High School friend and former workmate, Guy Venne). 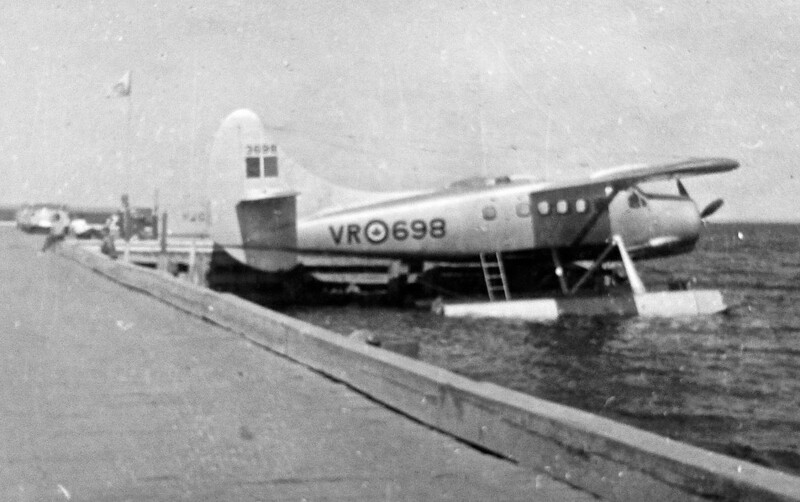 The RCAF often moored their DHC-3 Otters at the main dock in Cold Lake and the above aircraft appears to be the same one that is the subject of this post. Guy had taken several photos of the crash scene in French Bay, but all those photos were seized by the Air Force as part of their investigation. The three photos displayed in this story were also taken taken by Guy, one before the crash (above) and two after the craft had been towed to the main dock at Cold Lake. Damage to floats suggested a collision, but the Air Force had other ideas. The whole story was to become cloaked in secrecy (photos in footer). In a moment of absolute clarity Dwayne realized what was going to happen – his airplane was going to crash into the mountainside and there was not one thing he could do to stop the impending disaster. In a final act of defiance the plane would stall, drop one wing, enter a spin and spiral down into the ground at well over two hundred k/hr. To survive such a crash would be impossible. After a lifetime of safe flying how did Dwayne suddenly find himself facing this catastrophic situation? In these last few moments he shuddered to think how chance controls every move in our lives. He was an experienced bush pilot with thousands of hours of flying time and an impeccable record of safety. However, in the annals of bush flying, even the most experienced pilot can make little mistakes and sometimes even those little mistakes can lead to disaster. Today, all alone with his airplane in a remote area of the British Columbia, Dwayne made a few of those mistakes and in the next few seconds it would cost him dearly. A friend of the family, Dwayne, lives in Cold Lake, Alberta, a community 200 miles northeast of Edmonton. Cold Lake is known internationally for its giant airbase (CFB Cold Lake) as well as for the trillions of barrels of wet sticky tar sands that exist far below the ground. Dwayne, from his home base in Cold Lake, has spent much of his life flying bush planes over the Western Canadian and Alaskan hinterland. He has experienced flying conditions that range from 30F below in blinding snowstorms to well over 100F above dodging thunderstorms. Dwayne knows all to well the dangers of bush flying as he and other family members of his family have been in the business since the 1940s.